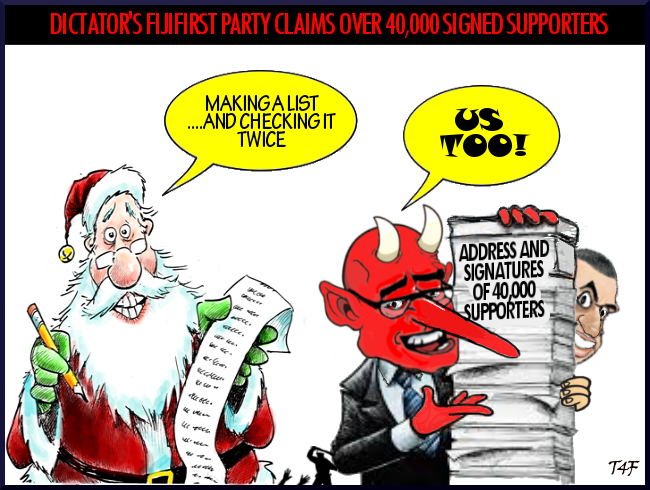 The corrupt, lying Fiji dictator is still yet to register his FijiFirst party. As directed by his puppet master, khaiyum, the names, addresses and signatures of more than 40,000 supporters will be published. This will take up over 500 pages. Wow! But why go to this extreme when only 5,000 signed up members are needed to register their party? Who are they trying to impress or convince? This all smells of desperation. Sodelpa’s General Secretary, Pio Tabaiwalu, says that when his party registered it pared down its list of supporters in order to keep publication costs down for the government.